Part of our mission at the TMJ & Facial Pain Institute is to help educate our patients as well as the general public, much of the health care field, and third party payers about TMJ, TMD and facial pain in general. Our goal is to eliminate some of the confusion that exists about these health issues and how their treatments should make logical, scientific sense. Accordingly, you can make informed decisions about your treatment options and receive the proper care you require to relieve your pain. Additional sources of information about TMJ, TMD and facial pain can be found on the Links page. What is conservative Phase 1 therapy? What should you expect from a TMD doctor? What should you expect during your office visit? What is Phase 2 therapy? Is TMJ/TMD covered by insurance? Not to make permanent changes to a patient’s teeth, through dental procedures, or permanent changes to the jaws or joints, through surgery, until he is certain these permanent changes are going to benefit the patient. In short: Conservative and reversible treatments should always precede permanent changes to a patient’s teeth or surgery. Conservative TMD therapy does not change the patient permanently in any way. It should always be the first approach to TMJ pain unless there is an obvious surgical situation such as a fractured jaw. Conservative therapy is also called Phase 1 therapy and in the majority of TMD cases, no additional treatment is needed. Bite splints are plastic appliances that fit over the upper or lower teeth and provide a surface for the dentist to control how the teeth opposite the splint will hit. By doing this, the dentist can control the positioning of the jaw and use the splint to reduce forces to the affected temporomandibular joints, relax muscles, and prevent further wear on natural teeth from grinding forces. Other than certain technical considerations for each individual patient, it makes no difference whether the splint is worn on the upper or lower teeth. It is Dr. Menchel’s personal preference to use lower splints because many of his patients wear the splint all day and night. Lower splints tend to be more comfortable, and allow better speech. Partial coverage splints cover only the back teeth or the front teeth. Because the teeth not covered do not touch with continuous wear of the splint, these teeth can now change position and erupt. The teeth that are covered by the splint can be compressed and unwanted major bite changes can occur. Dr. Menchel avoids using these splints whenever possible. Full coverage splints cover all the upper or lower teeth. Because all of the teeth are covered, the teeth under the splint are “retained” and cannot shift. In this case, bite changes are minimized because all of the upper teeth are touching the splint. The patient can wear these splints safely for a long time. Dr. Menchel and most other practitioners prefer to use these types of splints. Directive splints have depressions or guides in them that fix the opposite teeth and hold the jaw in a fixed position. These splints were very popular in the 1980s, especially splints that held the lower jaw forward in patients that had clicking joints. Permissive splints are totally flat and smooth. They allow the muscles to relax and the jaw to find its own “natural” unstrained position. They provide equal contact for opposite teeth so that the jaw is supported. They also allow smooth gliding movement of the teeth as the patient grinds, so that muscles are not activated. (Think of riding in a truck on a rough road versus a limousine on a smooth highway and how much more comfortable you are when you arrive at your destination while in the limo). Permissive splints are also constructed so that patients put less force on their jaw joints when they move their jaw to the side or front. This type of splint is the workhorse of Dr. Menchel’s practice. Most TMD patients who respond well to bite splints will continue to wear them when they sleep even after TMJ pain has been relieved. Simple TMD problems may be successfully treated by dentists, physical therapists or family physicians, as long as they are not making permanent changes in the patient’s status by surgery or dentistry. It only makes sense that more serious problems should be evaluated by a doctor who is familiar with all possible causes of the problems, who takes a complete history on the patient to rule in or out these possible causes, who makes an accurate diagnosis, and recognizes which conservative treatments will benefit the patient most before putting the patient through treatment that cannot be reversed. A dentist should always be included in the treatment. The physician should have a variety of approaches customized for each individual patient. Whether the pain is acute or chronic. A prognosis on how long before your pain will be relieved and how much of your pain can be expected to be relieved. 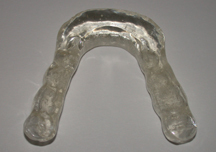 Bite splint or orthotic – This is a plastic mouthpiece worn on the upper or lower teeth, which relieves pressure on the joints, relaxes muscles, and allows the jaw to assume a position independent of the teeth. Medication – There are many medications available to relax muscles, reduce pain and inflammation, and allow you to sleep better to reduce grinding and clenching your teeth at night. Physical therapy – Physical therapists can analyze your posture, prescribe exercise and use various modalities such as massage, stretching, electrical devices, heat and cold. The goals are to reduce pain, increase strength and range of motion, and to prevent further joint injury. Injections – Muscles may be injected to find and help alleviate “trigger points” (areas of muscles that, do not stretch and cause pain). Sometime steroid injections are used to help alleviate muscle and tendon inflammation and soreness. Dentists will usually inject muscles in the mouth and on the face ahead of the ears. Physicians may inject back or neck muscles. Sometimes injections are necessary for diagnostic purposes. The dentist may numb muscles or joints to better evaluate the true origin of your pain. Botox® Injections – Now available in Dr. Menchel’s practice for extreme clenching and grinding problems, Botox can used to reduce severe myofacial pain and headaches. These injections are safe for use on facial muscles and help reduce the amount of force the patient is placing on his or her jaw. However, Botox can be costly and must be repeated every 2-3 months to sustain its effectiveness. Plus, it can reduce the size of the facial muscles, which some patients find unattractive. Conservative therapy may last for weeks or months depending on the diagnosis. If conservative therapy is successful, but the patient is not comfortable with his or her bite and must continue wearing a bite splint during the day, the following approaches may be helpful. They may also be helpful if the patient keeps getting recurrent pain from time to time. Please note that these are permanent changes in your bite and cannot be easily reversed. None of these procedures should be attempted unless the patient has demonstrated significant pain relief in Phase 1 therapy. If a bite splint does not relieve pain, none of these procedures can be expected to work. Many patients do not require Phase 2 treatment. They are comfortable after Phase 1 treatment and may continue to wear the bite splint and take medications occasionally. Other patients do not feel their bite is comfortable when they remove the bite splint. Some patients find they may be comfortable for a time but that their pain returns. These patients are candidates for Phase 2 treatment, which will correct their bite problems (malocclusion). Occlusal equilibration (tooth grinding) – The bite is changed by reshaping selected teeth with a dental drill. If small changes are needed, this may be the most desirable method. The dentist needs to practice on plaster models of your teeth first before touching your actual teeth, which will avoid unnecessary removal of tooth structure. Orthodontics (braces) – If the patient has healthy teeth that are sound (not many fillings or crowns), this is the best method for changing your bite. Crowns – If many teeth are broken down with large filling or old crowns, “capping” the teeth may be the best way to correct the bite. Jaw surgery – Some people have a bad bite because of misalignment of the jaws. In these cases, the jaws are freed by sectioning (cutting the bone) and then placing them into proper position. These patients need to have orthodontic treatment before surgery. Even though this is the most radical approach, it may be the best and only approach for some patients. It must be emphasized that this involves surgery of the jaw bones not the TemporoMandibular Joints. Jaw surgery is not TemporoMandibular Joint surgery! A bite splint and conservative therapy should always precede permanent bite changes. If a patient does not get relief of their symptoms in Phase 1 therapy, and there is a mechanical problem in the jaw joint demonstrated by MRI findings, then jaw joint surgery may be indicated. In major facial pain centers around the country, only 5-10% of TMD patients need surgery and only 6% of the patients in Dr. Menchel’s practice have required surgery. Patients with intractable pain that is not relieved, or with a sudden severe locked jaw should only wait a few weeks before surgery is recommended. Younger patients, especially teenagers, have better results with surgeries than adults. Most TMJ surgery is performed to treat patients with limited jaw opening (closed lock), where conservative therapy has failed. The jaw is blocked from opening because the disc or cartilage over the joint has loosened and is blocking opening. The most accurate diagnosis for this disorder is MRI imaging of both joints, and disc repositioning should not be attempted without this study. Arthrocentesis – This is a relatively simple procedure where needles are placed so that liquid can flow through the joint (saline solution and steroid to reduce inflammation). This “unsticks” the cartilage and, the patient can now open the jaw. The cartilage is still loose, however, and clicking of the jaw may remain. The downside of this procedure is that the cartilage is not replaced. It is also a blind procedure where the surgeon cannot see where the needles are and depends on experience and skill for good results. Athroscopic centesis and repair – An arthroscope is a needle with a television camera. Many surgeons prefer this procedure because they can see what they are doing. They free the cartilage and replace it on the jaw joint. There is no clicking after this procedure. TMJ microsurgery – In this procedure the surgeon makes a small incision in front of the ear and, using microscopic magnification, replaces the disc and repairs the joint. Open surgery – In this procedure the incision is larger so that the surgeon can see the entire joint while operating. If the cartilage is badly torn, or misshapen, it may be removed in the open procedure and sometimes it is not replaced. Various substances can be used, both natural and synthetic, to replace the disc. In the 1980s, synthetic Proplast was used to replace joint cartilages, which led to serious complications and the product was removed from the market by the FDA. Patients who had Proplast replacements required second surgeries to remove them. There are more complex surgical procedures, even artificial joint replacements, available today. Surgery is necessary in a minority of TMD cases and the surgery is similar to other orthopedic joint procedures (e.g., knee, hip, shoulder, etc.). One of the primary problems of TMJ surgery is the recovery phase. While a knee or a shoulder can be rested after surgical procedures, because of eating, chewing, talking and swallowing (plus habits such as nighttime tooth grinding) it is virtually impossible to “rest” the TMJs. Dr. Menchel believes this is why these surgeries are less successful statistically than other joint surgeries and why many patients still continue to have problems after surgical procedures. It is also the reason that conservative management should always precede surgery. Because of confusion in the medical and dental profession in this area, many insurance companies have “TMJ (or TMD) exclusions” in their coverage contracts. We will provide any patient in our office with an insurance statement you can send to your insurance company. Most TMD claims will be filed with your medical insurance, not dental insurance. Because of the wide range of coverage, we ask that you pay for your treatments and submit a claim for reimbursement to your insurance company. Our office manager will be pleased to make financial arrangements with you. This unfortunate situation could be easily remedied if the responsible organizations (ADA and AMA) would recognize a specialty in treating TMD and orofacial pain. There are now one- and two-year university residency programs in major dental schools where doctors who have special interest in these fields are trained.